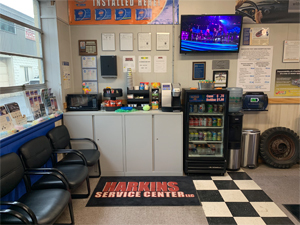 Harkins Service Center LLC Offers Expert Honda and Acura Auto Repair Services You Can Count On! Since 2010, Harkins Service Center LLC has provided motorists in the Harrisburg, PA 17103 area with comprehensive Honda and Acura auto repair services that include 4x4 Services, Alignment, Brakes, Car & Truck Care, Domestic Cars & Trucks, Electrical Services, Electronic Services, Engine & Transmission, Engine Maintenance, General Services, Heating and A/C Services, Import Cars & Trucks, Inspections and Emissions, Miscellaneous Services, Motorcycle Services, Tires, Transmission Services and Undercar Services. Our goal is to offer the best services available at affordable prices to get you back on the road in no time. 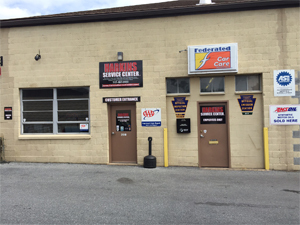 For a high-performing vehicle, trust Harkins Service Center LLC with your car, truck, or van. To learn more about the services we offer, please contact us by phone at 717-497-2033 or send us an email. We also invite you to learn more about our dedication to you, our valued customer. 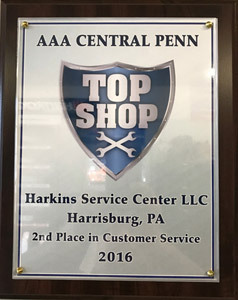 In AAA Central Pennsylvania Approved Repair Facilities we achieved 2nd place in the Top Shop in Customer Service. We did this in our first year in the program against 72 other AAA Approved Repair Facilities. Bruce Phillips of AAA presented us a plaque and took pictures. An article and write up with pictures will be in the next issue of AAA Now! Magazine.